Posted By:@AVGJOhanna | At:10:49 AM Be the first to comment! 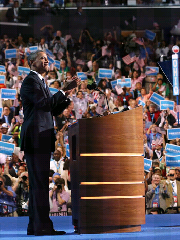 Once I realized that President Obama's 2012 DNC acceptance speech was coming to a close, I thought, "that's it?" Something happened and I seemed to miss a good chunk of the speech. Perhaps I blanked out. We did experience a technical problem but I didn't think we missed that much. After hearing the commentary, I realized I missed something and figured I would have to watch it again. Even though I have the day off I woke up way too early, much to my chagrin. But I pulled up the speech and realized that indeed I missed some key statements. It was a great speech indeed but I cannot say that it was his best speech. He got the job done for sure. I guess his previous speeches set the bar high and I expected this one to be the best. Make no mistake about it, from an oratory perspective he competes only with himself, in my opinion. I am not disappointed in the least. I just cannot say it was his best. But in all honesty, it did not have to be. Perhaps to his own detriment, the President has had to be his own spokesperson throughout his time in office. Yes he needs to be a great communicator, but he should not have been the only communicator. I have felt in many cases the President was fighting all by himself and he simply cannot do this alone. I had been waiting for better communication and support for him. And FINALLY, the DNC delivered. I think the country needed to see the other faces that not only agrees with the President but appreciates his leadership and accomplishments. The country needed to see that his ideas did not come from some foreign place. The DNC pulled out all the stops and left the RNC in its dust. The speechwriters were brilliant. The speakers delivered with such palpable passion. The President was given a respite of sorts. He didn't have to do all the heavy lifting and save the day. I hope that he felt the support and left more encouraged and determined. Hope and change is not a lost cause. It is precisely what is needed. It is not a mere campaign slogan. It is his vision. It is his message. A pretty persuasive one at that. People act like this is just some guy on a soapbox just flapping his gums. Hope and change is what got him elected. As he so aptly said it, he is the President. Seems like he has an accurate pulse of the American people. One just does not become President on a whim. The people vote him into that position. And after a long stint of "silence" from his surrogates and base, the DNC showed that the people are not just offering blind loyalty and the customary partisan support. The people are excited about the fact that he is the President and would like him to remain so and through the DNC the people have said so.